I guess my posts on Mel’s Mouth have become a series of sermons — a mini-sermon every day with an occasional full sermon when I am called on to preach one. My next date in the pulpit will be November 1, and I’ll probably post the sermon that day. If you live anywhere near the Unitarian Universalist Church of Loudoun (Virginia), come hear me in person. I mention sermons because coming back to yesterday’s subject, anti-racism, will, I hope, afflict the comfortable, and the uncomfortable as well. Many of us have deep difficulty talking about race in America. So let me be clear about where I stand. Until we all blend into what I guess will be the color of light coffee, bias will continue. It’s in our genes to identify more with one group (tribe) than another. Once we have blended, maybe a new dividing characteristic will appear. That doesn’t make us evil; it gives us an obstacle to overcome. I believe we have to love and respect ourselves, biases and all, before we can overcome them. Pretending that we’re colorblind only makes things worse. If we don’t see and respect our full selves, how can we see and respect anyone else? I knew that my title yesterday, Why I Flunked Anti-Racism 101, was provocative, but the post got much more attention than I anticipated. I must have touched a nerve. One reader complained on Facebook that I should simply have made my point without telling a story that seemed to belittle my teachers and classmates. I write the way I do because stories and humor attract readers and make the point clearer and more memorable. But maybe the subjects of anti-racism and Unitarian Universalism’s other periodic obsessions deserve a more serious post to follow yesterday’s. These periodic obsessions plague many political liberals as well as we UUs. Thanks to K.L. Allendoerfer of the blog A Thousand Finds for pointing me toward a probing, perceptive article by the Rev. Dr. Thandeka, one of UUism’s brilliant thinkers and founder of Affect Theology. Thandeka’s 1999 article, Why Anti-Racism Will Fail, needs to be read on its own, and I won’t try to rephrase it in detail. But it is, if anything, more relevant today than it was in 1999, as white UUs and other religious and political liberals fail to understand and overcome the source of their guilt feelings over police killings of unarmed blacks. We’re stuck in Christian original sin, according to Thandeka, and groping for Salvation. But confessing our supposed sins will not get us anywhere helpful. 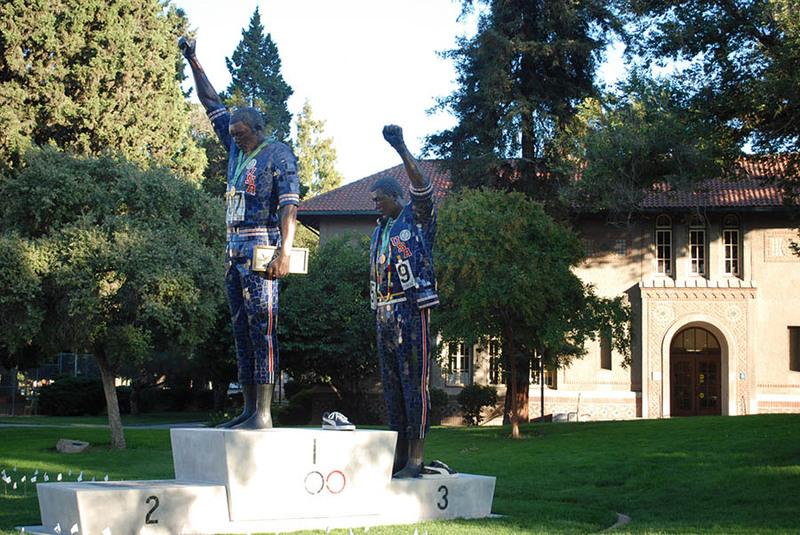 Statue at San Jose State University leaves empty the platform where Norman stood. She imagines a world where the ruling elite declares that all left-handed people must have their left hands amputated, and that becomes the societal norm. Does that mean that right-handed people now have right-handed privilege because they still have two hands? Right-handed people have not benefited because they did not have something taken away from them. The sense of right-handed privilege only affirms the powerlessness of all in the face of an unjust culture. I’d assert that the amputations harm the right-handed, too, because of the guilt feeling and the inevitable societal tensions. As I said in yesterday’s post, because racism harms all of us, people of color don’t own the issue. I stopped short of mentioning whites who have lost their lives and suffered in other ways because of their commitment to a just world. But my son Carl Pine and another friend, Christopher d’Arcy, brought my attention to The White Man in That Photo, an article by Riccardo Gazzaniga about Peter Norman, the Australian sprinter in the famous photo of John Carlos and Tommie Smith raising their gloved fists in a Black Power salute during medals ceremony at the 1968 Summer Olympics in Mexico City. Norman, who finished second in the race, was not just some white guy caught in the camera’s lens. Carlos and Smith had told Norman about what they planned, and Norman helped them plan it. Then he obtained an “Olympic Project for Human Rights” button to wear during the ceremony. Today, this doesn’t seem terribly daring for an Australian athlete, but at the time his country was decimating Aboriginal culture and family life. His gesture cost him a future and a place in Australian sports history. Carlos and Smith lived to be honored by their country. Norman did not. Injustice belongs to all of us.